so the only thing to do now is start repeating. The Herb Block Foundation has announced that Matt will receive the 2019 Herblock Prize, making him the first to be honored twice. The Herb Block Foundation revealed the winner today. Judges called Davies “a veteran cartoonist working at the top of his game,” adding that they were impressed by the “strength and consistency” of his portfolio. Like a proud parent Newsday boasts about the distinction. Davies will receive a $15,000 after-tax cash prize and a sterling silver Tiffany trophy in a ceremony set for May 2 at the Library of Congress in Washington, D.C. Jake Tapper, CNN’s chief Washington correspondent and himself a sometime political cartoonist, will deliver the annual Herblock Lecture at the ceremony. Any hesitance on the part of the judges to break precedent by awarding a previous winner was overcome by the strength and consistency of Davies’s portfolio. 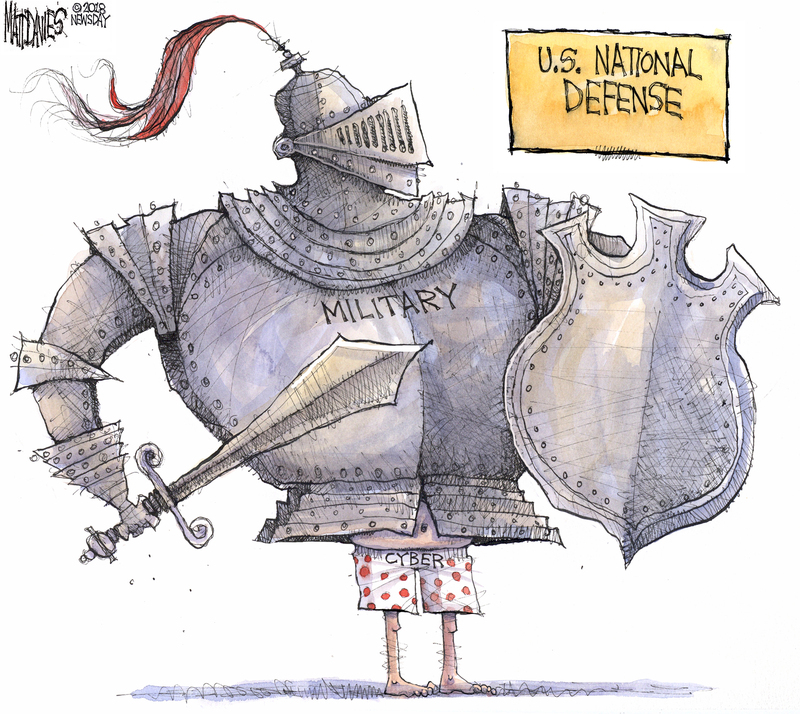 A veteran editorial cartoonist working at the top of his game, Davies has a unique, trademark style of drawing that effectively conveys humor without making light of the serious issues at hand. He doesn’t just settle for the same old visual metaphors so commonly found in editorial cartooning today, and he does not insult his reader’s intelligence with over-labeled work. The judges were impressed by the wide range of topics Davies tackled, including many that did not appear in other portfolios. He approaches topics with succinct precision and visual wit. And congratulations to Herblock finalist, Clay Jones! 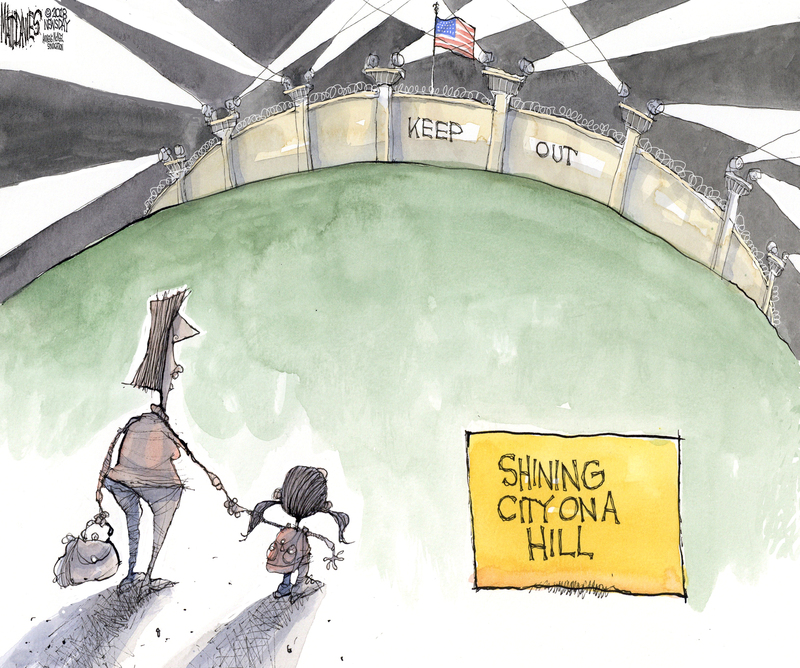 Great work by both cartoonists! 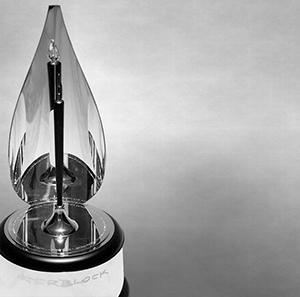 Does the Herblock finalist receive anything other than the prestige of coming in second? Clay Jones has been on fire the last year. Besides drawing one or two cartoons a week, he also delivers daily commentary on his website, claytoonz.com. I spoke w/ the head of the Herb Block Foundation yesterday. Nice lady and I will not use her name. After pointing out that every conservative edit. cartoonist I know loves Matt’s work -but they haven’t entered her contest in ten or more years. Why would we? Their site lists past winners and runner ups from 2004 to present. Not one conservative. (that’s 28 cartoonists my math is right) It’s her contest and she’s damn well entitled to run it as they see fit especially since Herblock was certainly no conservative. But it’s clearly an award not for editorial cartooing but for liberal editorial cartooning. Speaking only for myself I don’t want to win a contest where liberals were excluded. That said MD is a helluva cartoonist and I’m very happy for him. First prize was $10,000.00 tax free. 27 queries in 0.225 seconds.